Multipotent mesenchymal stromal cells isolated from bone marrow and other sites are currently being studied to determine their potential role in the pathogenesis and/or management of autoimmune diseases. In vitro studies have shown that they exhibit a dose-dependent antiproliferative effect on T and B lymphocytes, dendritic cells, natural killer cells and various B cell tumour lines – an effect that is both cell contact and soluble factor dependent. Animal models of autoimmune disease treated with multipotent mesenchymal stromal cells have mostly exhibited a positive clinical response, as have a limited number of patients suffering from acute graft versus host disease. This review summarizes the findings of a 1-day meeting devoted to the subject with the aim of coordinating efforts. Although mesenchymal stem cells (MSCs) are most readily recognized in the musculoskeletal system as potential orchestrators of bone and cartilage repair, it has become apparent in recent years that they may also have profound immunomodulatory effects. Around 70 people participated in this 1-day meeting at the Kennedy Institute for Rheumatology, London, on 31 October 2005, to explore the latter aspect of MSC biology in relationship to autoimmune diseases (ADs). The aim was to bring together workers in the fields of MSC biology and AD in order to define areas of potential synergy and interdisciplinary collaboration. As pointed out by the director of the institute, Marc Feldmann, following the rapidly growing activity in the past few years in defining stem cell participation in autoimmune mechanisms and in the use of adult stem cells to treat ADs, a focus on the MSC has emerged. Such cellular therapy is already in an exploratory phase for treating severe acute graft versus host disease (GvHD) , which bears many similarities to some severe inflammatory ADs. The mechanisms for such positive therapeutic effects remain partly obscure, but the antiproliferative properties exerted by MSCs on other cells is an important component . In addition, MSCs have been shown to exhibit tissue protective and regenerative properties beyond immunosuppression, making them attractive therapeutic agents in complex AD in which an admix of inflammatory and scarring tissue damage is often present. On the other hand, MSCs may also actively participate in initiating AD , they have the potential to favour spread of melanoma metastases  and, although mostly immune privileged, they may under certain conditions also be subject to immune rejection . Thus, their role in treatment of ADs must be assessed carefully. Although a true mesenchymal stem cell undoubtedly exists, the commonly used terminology for various stroma-derived progenitor cells, 'MSC', is scientifically inaccurate because a true stem cell property has not been demonstrated. A true stem cell, when dividing, gives rise to one daughter cell that retains its full stem property, whereas the second daughter progenitor cell has the potential, on proliferation and differentiation, to replenish a complete pleiomorphic tissue compartment. The best studied example is the haematopoietic stem cell. Also, the difference between embryonic and adult (postnatal) somatic stem cells should be emphasized. The International Society of Cellular Therapy recently reported a consensus statement on the nomenclature and definition of these progenitor cells . Better termed a 'multipotent mesenchymal stromal cell', such a cell should be plastic adherent (1–5 days), have fibroblast-like morphology, bear at least the stromal markers CD73 and CD105, and be negative for the haematopoietic markers CD14, CD34 and CD45. Although opinions differ , the commonly agreed markers are highlighted in bold in Table 1. In addition, a trilineage potential for osteogenic, adipogenic and chondrogenic differentiation should be demonstrable (Figure 1). Chondrogenic differentiation is a tedious procedure to perform. However, cell populations satisfying these criteria are likely to still be heterogeneous. For practical purposes, the multipotent mesenchymal stromal cell is abbreviated to MSC in the subsequent text. The most commonly agreed markers are highlighted in bold. Trilineage differentiation of MSCs. Images by courtesy of Ivan Martin. DMEM, Dulbecco's modified Eagle medium; ITS, insulin transferring selenous acid; MSC, mesenchymal stem cell (multipotent mesenchymal stromal cell); TGF, transforming growth factor. 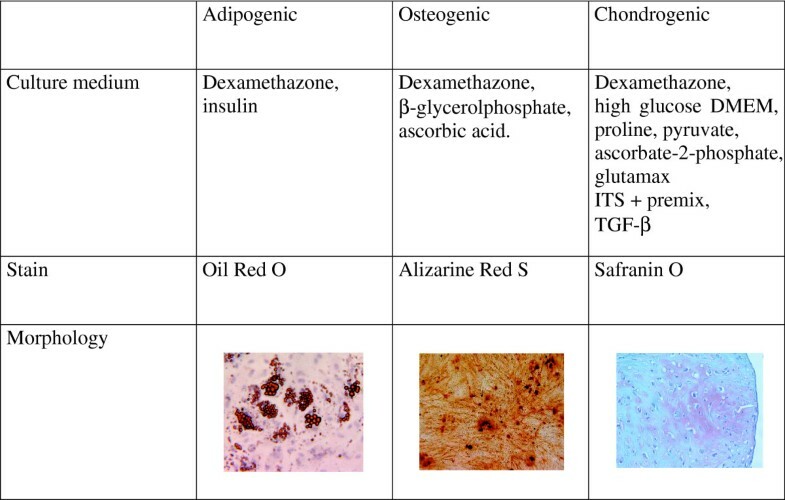 During the past few years various phenotypic descriptions of MSCs in mouse and humans have been employed, which are partly summarized in Table 1. This has led to some confusion because the original monoclonal antibodies used by early workers have since been shown to be directed to epitopes on known CD antigens, for example SH3 and SH4 bind to epitopes on CD73  and SH2 to CD105 (also called endoglin). An extensive and referenced summary of MSC phenotypic nomenclature is presented in Table 2. DC, dendritic cell; HGF, hepatocyte growth factor; IDO, indoleamine 2', 3'-dioxygenase; IL, interleukin; MLR, mixed lymphocyte reaction; MSC, mesenchymal stem cell (multipotent mesenchymal stromal cell); PG, prostaglandin; STAT, signal transducer and activator of transcription; TGF, transforming growth factor. MSCs were originally described in bone marrow (BM) , where they were also termed 'marrow stromal cells'. However, it has now became clear that similar but heterogeneous populations of progenitor cells are also present in many other tissues. MSCs can be isolated from periosteum [7, 10], muscle [11, 12], synovium , synovial fluid , liver and blood , cord blood  and fat , among others. The source of MSCs has an influence on phenotype and functional properties. Cosimo De Bari reported that human MSCs from periosteum have greater capacity to form bone in vivo than do human MSCs from synovial membranes . Simon Jones and Christian Jorgensen showed that synovia-derived MSCs also differ from their BM counterparts in their gene expression profiles, with activin A being more highly expressed in BM-MSCs . Katarina Le Blanc pointed out that MSCs differ between foetal and adult tissues, as indicated by the differential expression of genes related to tissue development, cell cycle promotion, chromatin regulation, DNA repair and immunological antigen presentation . Lastly, but not surprisingly, the differentiation of MSCs also was found to alter their functional properties. MSCs have immunomodulatory properties that are among the most intriguing aspects of their biology . Francesco Dazzi reported, in a murine model, that MSCs inhibit the division of stimulated T cells by preventing their entry into the S phase of the cell cycle and by mediating an irreversible G0/G1 phase arrest . MSCs also induced arrest of T-cell division in mixed lymphocyte reactions (MLRs); this effect was irreversible upon removal of the MSCs. In primate  and human [22, 23] models reversibility is observed. In contrast to the strong inhibitory effects of MSCs on T-cell proliferation, there were only relatively minor and reversible effects on the T-cell effector function, as measured by IFN-γ production, and no effects on T-cell activation, based on CD25 and CD69 surface expression. Dazzi summarized these differential immunomodulatory effects of MSCs on T-cell functions as 'split tolerance'. The T-cell inhibition does not appear to be antigen specific , works across HLA barriers, and targets primary and secondary responses . Interestingly, the T-cell proliferation was found to be inhibited across strain (allo-) and species (xeno-) barriers. Jones, however, showed that immunosuppression may be not only be an intrinsic property of MSCs in particular but also of mature and immature stromal cells in general, because osteoblasts have similar antiproliferative effect (unpublished data). Vito Pistoia outlined that MSCs also have an effect on B cells. In vitro, B-cell proliferation is inhibited by MSCs in a dose-dependent manner, with maximum inhibition observed at a B-cell/MSC ratio of 1:1 . Soluble factors are involved. B-cell inhibition by MSCs is attributable to blockade in G0/G1 phases of the cell cycle similar to T cells. MSCs also reduce the expression of chemokine receptors and immunoglobulin production by stimulated B cells. MSCs, however, do not appear to alter surface molecules that are involved in stimulatory cell cooperation (HLA-DR, CD40 and B7 family) or to inhibit the expression of tumour necrosis factor (TNF), IFN-γ, IL-4 and IL-10. Willem Fibbe showed that MSCs also inhibit the differentiation of monocytes into immature dendritic cells (DCs) . Dazzi and coworkers have confirmed this observation and demonstrated that MSCs mediate a block of the monocyte cell cycle at the G0 phase in this case also . Cell contact between MSCs and DCs is not required and soluble factors that mediate inhibition of differentiation are produced as a result of crosstalk between MSCs and DCs. Expression by DCs of costimulatory molecules is downregulated, and DCs exhibit impaired cytokine production and a reduced ability to stimulate T cells. MSCs also inhibit the IL-1 and CD40 ligand induced maturation of immature into mature DCs. Aggarwal and Pittenger  also demonstrated that MSCs cause immature DCs to decrease TNF-α and mature DCs to increase IL-10 secretion. It has been suggested that natural killer (NK) cell function is also affected by MSCs, with downregulation of IFN-γ secretion , but in vitro data reported by Le Blanc and coworkers  suggest that neither NK cell nor cytotoxic T lymphocyte (CTL) lysis is affected by MSCs. On the other hand, the same group from the Karolinska Institute showed that MSCs reduce the formation of CTLs via a soluble factor, but they are not themselves subject to immune recognition by CTLs and allogeneic NK cells . Recently reported data  suggest that MSCs significantly inhibit IL-2 stimulated proliferation of resting NK cells, but they only partly impair activated NK cell proliferation. The same group showed that IL-2 activated NK cells lyse autologous and allogeneic MSCs, which is a property not seen with freshly isolated NK cells. Cell-cell contact and soluble factors such as transforming growth factor-β and prostaglandin (PG)E2 are responsible for this effect . Moreover, when MSCs were exposed to IFN-γ lysis was reduced, presumably because of upregulation of HLA class I molecules on the MSC surface. The NK receptors activating the lysis included NKp30 and NKG2D, for which MSCs have ligands. This has also been demonstrated by another group ; however, that group did not demonstrate protection by expression of HLA class I molecules on the MSCs. Several speakers addressed the issue of the role of soluble factors in the immunomodulatory properties of MSCs. Human MSCs caused T-helper-1 cells to decrease IFN-γ and T-helper-2 cells to increase IL-4 secretion. Addition of IFN-γ to MSCs in vitro increases their antiproliferative effect in a MLR . A critical effect of IL-6 in MLRs was stressed by Jorgenson, who showed that IL-6 was released by MSCs and that, if blocked with anti-IL-6 antibodies, normal T-cell proliferation was restored in an MLR. Fibbe also showed in DCs that the MSC-mediated immunosuppression was prevented by addition of anti-IL-6 and anti-macrophage colony stimulating factor antibodies, at least in part . TNF-α also reversed the immunosuppressive effect of MSCs on the MLR. Previous experiments by Di Nicola and coworkers  have suggested that two soluble factors, namely hepatocyte growth factor and TGF-β, were also involved. The addition of anti-HGF and anti-TGF-β partially restored the proliferation of CD2+ cells in the presence of MSCs. However, others were unable to reproduce these results . Indoleamine 2', 3'-dioxygenase (IDO) is an enzyme that is induced by IFN-γ on the surface of antigen-presenting cells and then converts tryptophane to kynurenine. The degradation of tryptophane, as an amino acid that is essential for lymphocyte proliferation, was suggested to inhibit T-cell proliferation . The same mechanism has been shown to operate for MSCs as well . However, interpretation of these effects is complicated by the fact that the immunosuppressive kinetics of MSCs were found not to correspond to those of IDO expression and tryptophane depletion [37, 38]. Recently, failure to achieve significant restoration of T-cell proliferation via tryptophane addition was reported and attributed to the production of T-cell inhibitory kynurenine metabolites, which may have immunosuppressive properties in their own right [39, 40]. Inhibitors of PGE2 synthesis mitigated the overall immunosuppressive effects in co-cultures, suggesting that PGE2 may also play an important role in the immune modulation . However, others have not detected significant reversal in T-cell proliferation when using PGE2 synthesis inhibitors or tryptophane . Jorgenson investigated a murine MSC line and found PGE2, but not IDO, to be involved in the immunosuppressive effects. MSCs not only appear to downregulate the immunoreactivity of a variety of effector cells, but also they themselves are believed to escape immune rejection. MSCs are not targets for CD8+ cytotoxic lymphocytes or KIR-ligand mismatched NK cells in vitro [34, 38, 41, 42]. After in utero transplantation into sheep, human MSCs persist in the long term and demonstrate site-specific differentiation . Chiara Bocelli-Tyndall tested the ability of healthy BM-derived MSCs to suppress the proliferation of PBMCs derived from healthy donors or from patients with a variety of ADs. MSCs lowered the proliferation of PBMCs stimulated with anti-CD3 and anti-CD28 monoclonal antibodies by 50–90%, depending on the cell ratio. The immunosuppressive effect was independent of the source of PBMCs and of AD subtype, disease activity and concurrent treatment. In addition, BM-derived MSCs from AD patients were also suppressive in autologous and allogeneic settings. A variety of transformed and malignant B-cell lines were also suppressed by BM-derived MSCs, again in a dose-dependent manner . These results were confirmed by Jones, using MSCs derived from the synovial membrane of rheumatoid arthritis (RA) patients, although there was variability in their progenitor function as indicated by differentiation potential. Serena Guiducci has compared morphological and functional properties of BM-derived MSCs from patients with systemic sclerosis (SSc) and healthy control individuals. No significant differences were observed with respect to the formation of fibroblast colony forming units and the differentiation potential of MSCs into the osteogenic and adipogenic lineages. On the other hand, MSCs from SSc patients exhibited impaired ability to form capillary-like structures in vitro (unpublished data). This is an interesting observation in the light of the impaired vascular functions observed in SSc patients. Giuseppina Pennesi pointed out that MSCs differ between mouse strains in their clonogenic, differentiation and proliferation potentials. There may be also differences in cytokines and their receptors. Differences between species were reported by LeBlanc, who showed that human MSCs engraft in sheep whereas they elicit xenoreactions and are rejected in rats. Quantitative in vitro differences were observed by Frank Luyten, who compared the osteogenic potential of periosteal derived progenitors between humans and rabbits. In vivo, however, the difference was more striking; whereas human progenitors were able to differentiate into bone, their rabbit-derived counterparts were not . From the clinical point of view, MSC research is currently focused on four areas of intense interest: MSCs may be used to engineer cartilage, bone, muscle, fat, tendon and neuronal cells; they may serve as cell vehicles for gene therapy; they may enhance engraftment in haematopoietic stem cell transplants; and their immunoregulatory properties, if proven to be effective in vivo, could be of therapeutic use in AD. Dennis McGonagle emphasized the differences between MSCs in vitro and those in vivo and the possible implications of these for the immunomodulatory activity of MSCs. For example, when culture expanded MSCs are MHC class II and CD80 negative, both of these markers are present in vivo . In patients suffering from RA and osteoarthritis, MSCs were more than 20 times more numerous in osteoarthritis than RA . These findings emphasize the importance of establishing the relationship between MSCs and inflammation in vivo. Furthermore, MSCs derived from synovial membranes differed in their expression of transcription factors and differentiation potential compared with mesenchymal cells derived from other sources such as skin fibroblasts . Ivan Martin studied the expansion of MSCs in three-dimensional scaffolds. Three-dimensional culture is an interesting new approach to large-scale commercial production and tissue repair (for example, bone and cartilage) because of the improved clonogenicity and differentiation capacity of MSCs . Bocelli-Tyndall, in collaboration with others, has shown that mature articular chondrocytes are more antiproliferative than de-differentiated chondrocytes or BM stromal cells or dermal fibroblasts, raising the question of the role of the antiproliferative effect in the control of tissue organization and maintenance . Nico Wulffraat reported that local delivery of adult MSCs improved the regeneration of menisci in a caprine model of osteoarthritis and retarded the progressive destruction normally seen . Le Blanc also highlighted the potential use of MSCs in cellular therapy for bone diseases. In children with osteogenesis imperfecta, osteoblast engraftment (1.5–2% donor cells) was detected after postnatal MSC infusion; also, improvements in bone mineral content and growth velocity, and reductions in bone fracture frequency were recorded [50, 51]. Le Blanc also reported on an intrauterine transplantation into a female human foetus with osteogenesis imperfecta. MSCs from an HLA-mismatched male donor were infused in the 32nd week of pregnancy. After an uneventful pregnancy a bone biopsy performed at 9 months of age demonstrated engraftment of Y chromosome positive cells (7.4% of total cells) . These findings prove that allogeneic mesenchymal cells can engraft and differentiate into bone. Myogenic differentiation of MSCs may also be employed for muscle repair. Human MSCs preferentially home to damaged muscle after systemic administration . They contribute to myofibres and to long-term persisting functional satellite cells; furthermore, they restore sarcolemmal dystrophin when they are injected into the muscles of the immunosuppressed myodystrophic mdx mouse. MSCs are capable of homing to the BM and survive in the long term (>1 year) . In an allogeneic animal model, they were not rejected by the host . However, recent data from a murine model suggest that, in nonmyeloablated hosts, allogeneic MSCs are able to mount a T-cell memory response, which results in rejection of the haematopoietic stem cell graft derived from the same MSC donor . A similar loss of immune privilege has been reported by others . Because of their particular function in the marrow microenvironment, there is evidence suggesting that MSCs improve haematopoietic stem cell engraftment by replacing the damaged marrow stroma after myeloablative chemotherapy. Although several studies in animal models clearly showed that stromal cells could help in haematopoietic recovery, controversial findings have been reported in humans. In fact, it is not clear whether MSCs can replace the marrow stroma damaged by the myeloablative chemotherapy. When extensively T-cell-depleted marrow or mobilized blood was given, a low percentage (17%) of mixed chimerism could be detected at the stromal cell level, suggesting a limited but effective capacity of reconstituting the BM microenvironment . An immunosuppressive effect of MSCs in vivo was first suggested in baboons, in which infusion of ex vivo expanded donor or third-party MSCs delayed the time to rejection of histoincompatible skin grafts . Several presentations dealt with the potential use of MSCs in acute GvHD. The amount, timing and source of MSCs appear to be important. MSCs reduce acute and chronic GvHD when co-infused with HLA identical haematopoietic stem cells. Dazzi reported that multiple but not single infusions of MSCs prevent the generation of GvHD effectors in a NOD SCID (nonobese diabetic, severe combined immunodeficient) mouse model receiving human donor lymphocytes. MSCs administered at the time of established GvHD in contrast were ineffective. This is consistent with a recent report  in which the authors were unable to show reduction in GvHD in a murine model (C57BL/6 into BALBc), although the MSCs were given in doses that were immunosuppressive in vitro. These observations were not due to the rejection of the MSCs. Haploidentical MSCs were used in a 9-year-old boy with severe treatment-resistant GvHD of the gut, skin and liver after allogeneic haemopoietic stem cell transplantation for acute lymphocytic leukaemia. The boy's symptoms of GvHD and related clinicopathological findings improved after transplantation of haploidentical MSCs derived from his mother . Several international randomized trials are being launched under the auspices of the European Group for Blood and Marrow Transplantation stem cell subcommittee targeting acute GvHD treatment and prevention, using standardized expansion protocols and defined culture media based on phase I/II experience . Antonio Uccelli showed that MSCs improve both clinical and histological severity of experimental allergic encephalomyelitis. Early after infusion, the MSCs engraft in secondary lymphoid organs, where they induce reversible T-cell unresponsiveness and possibly also impair B-cell responses . At a later stage after infusion, the MSCs reach the subarachnoid space and then diffuse inside the inflamed parenchyma. The responses were more pronounced when MSC treatment was initiated early in the course of the disease. Reversal with IL-2 treatment indicates that anergy rather than clonal deletion had occurred . In collagen-induced arthritis, findings are different from those in the experimental allergic encephalomyelitis models. Jorgensen reported that his group was unable to demonstrate a beneficial effect when injecting the murine C3HT101/2 MSC cell line systemically or intra-articularly. Labelled MSCs were not found in the articular environment . The lack of therapeutic success may be attributed to increased levels of TNF-α in experimental arthritis, which was shown to reverse the immunosuppressive properties of MSCs. However, Pennesi suggested a beneficial effect in another murine arthritis model. The anti-inflammatory effects of MSCs have been also tested in mice exposed to bleomycin, a model of lung fibrosis. When MSCs were infused immediately after injury, they homed to the affected lung and reduced inflammation and fibrosis. This effect was not observed when MSCs were given late after the induction . Clearly, more animal model work is required. Luyten gave an overview about the difficulties in the widespread clinical exploitation of MSCs. One major problem is the lack of a commercial Good Manufacturing Practice licensed MSC product. There are no generally accepted assays of the potency of MSCs, and the optimal route of MSC delivery must be defined for individual indications. The best MSC source, its purity and the optimal dose remain to be specified. Purity, also defined as the identification and presence of 'contaminating' cell populations, is critical because the degree of contamination may affect both the biological effects observed as well as the potential side effects. Quantification of all of these factors will be required to obtain a reproducible and consistent cell preparation that could potentially be used in clinical studies. Safety issues are a concern, although injection of syngeneic, allogeneic and xenogeneic MSCs into immunocompetent mice is tolerated without apparent side effects. MSCs, however, are weakly HLA class I positive; thus, repeated infusions may induce alloreactivity. Moreover, MSCs are currently cultivated in the presence of animal serum. In the therapy of osteogenesis imperfecta by MSCs, antibody formation to foetal bovine serum was detected in some subjects . This and other risks associated with usage of animal serum may be overcome by its replacement with human platelet lysate, which also promotes MSC expansion . Finally, MSC-induced immunosuppression may foster the growth of tumours, as exemplified in a murine melanoma model . A platform model for cellular therapy research and application was presented by Constantino Pitzalis who emphasized the need for assessing the ability of a biological agent to achieve its defined effect, to measure potency and to ensure that bioassays include animal based, cellular and biochemical systems. A model of vasculogenesis in a SCID mouse was presented as an example. The potential antiproliferative and immunodulatory role of MSCs is being intensely studied by diverse groups, with the hope that MSCs may be developed as a new treatment for severe human ADs. Despite the heterogeneous nature of stromal progenitor cell populations, a consensus concerning the definition of MSCs and Good Manufacturing Practice protocols are evolving. Acute GvHD has been modulated successfully in case reports and small series, with apparently low acute toxicity [57, 63]. Long-term safety data are needed. Scanty and sometimes contradictory AD animal data are available. Although the results from syngeneic and autologous MSC infusion mostly support the concept, more data on the immunonogenicity of MSCs in nonimmunocompromised animals, on the optimal source, on the timing and number of cells to be infused, and on the location and determinants of cell homing are needed. It would also be desirable to characterize better the differences in functional and antiproliferative properties of BM-derived MSCs between individuals suffering from various ADs. Recent work suggests that BM MSCs from AD patients may not be equivalent to those derived from healthy individuals in all respects . It is also foreseeable that autologous sources of MSCs other than the BM could be employed. For example, adipose tissue derived MSCs were recently suggested to have properties similar to their BM-derived counterparts . In addition to the current application of MSCs in the treatment and prevention of acute GvHD, MSCs could also be considered in the emerging programme of allogeneic haematopoietic stem cell transplantation for AD . Clearly, a prospective co-ordinated programme would be best, with collaboration between groups dealing with autoimmune diseases and cellular therapies.